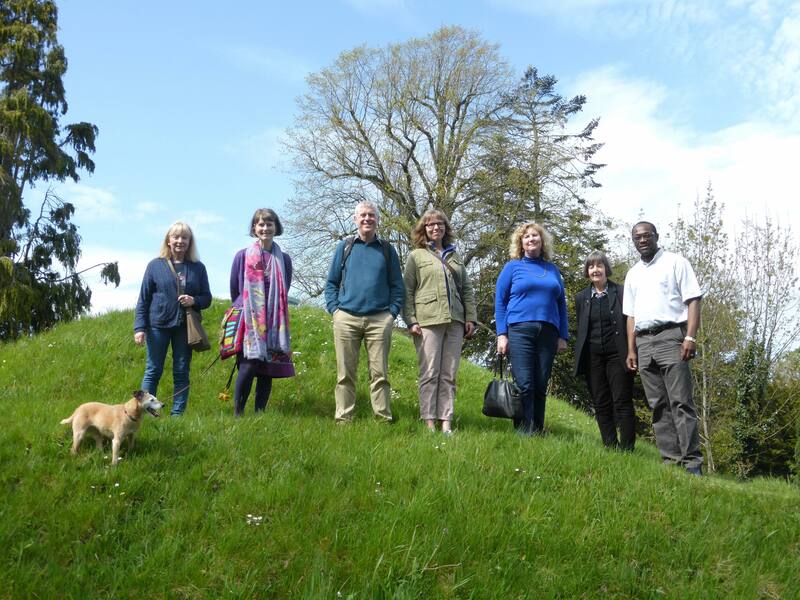 On 5 May 2018, the President of the Society for Folklife Studies Dr Daffyd Roberts led a Study Visit to both First Dunmurry (Non-Subscribing) Presbyterian Church and Kilwarlin Moravian Church in Northern Ireland. Dunmurry retains a strong village identity and is situated on the outskirts of Belfast. The Non-Subscribing Church there is the third structure to have been built on the site and was constructed in 1779. It is best described as a vernacular gem. The Moravian church at Kilwarlin is in a rural setting about ten miles away from Dunmurry, and was originally founded in 1755 by the evangelist and hymn writer John Cennick. The Non-Subscribing tradition represents the liberal strand of Irish Presbyterianism, which is perhaps less well known than are some other dimensions of dissent in Ireland. (Non-Subscribers do not subscribe to any Creeds or Confessions, particularly the Westminster Confession). The church in Dunmurry has a lengthy tradition of social and theological liberalism which it continues to uphold. The Rev Dr Henry Montgomery, who in 1830 led the Remonstrance against increasing conservatism in Irish Presbyterianism was minister there for many decades and is memorialised inside the church and by a blue plaque. He is buried in the quiet churchyard, and the inscription on his tombstone is of great historical interest. In addition to being a beautiful building, Dunmurry meeting-house also several other fascinating monuments, including one to a member of the Andrews family. Naval architect Thomas Andrews famously died on the Titanic, and the family were Ulster Unitarians. The church also features a magnificent window attributed to Tiffany. In the Non-Subscribing tradition, Communion usually takes place only twice a year, at the beginning of both May and November. The Dunmurry church retains an ancient form of Communion observance, and it was possible to see how this takes place as the Communion Tables were in place during the Study Day. Rev Linda Ballard, Immediate Past President of the Society was on hand to explain how this service is conducted as well as to outline aspects of the history of the church and of the Non-Subscribing tradition. After lunch, we travelled in the company of Rev Dr Livingstone Thompson to Kilwarlin. 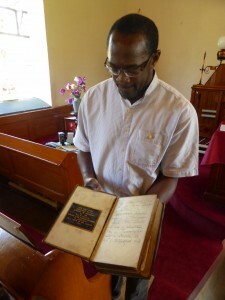 Rev Dr Thompson is a noted theologian and historian of the Moravian tradition. The present church building at Kilwarlin dates from 1835, when it was rebuilt by its remarkable Greek pastor, Basil Patras Zula, who also constructed a Battlefield Garden on the site to commemorate the Battle of Thermopylae. The story of Zula himself, the son of a Greek chieftain, and of how he came to be in Kilwarlin, is extraordinary, and a visit to the historic Battlefield Garden is a rare privilege. We were fortunate to hear about this from Rev Dr Thompson, and to see many of the remarkable historical artefacts to be found in the church, where we also discovered a great deal about the history of the Moravian tradition. We also had the opportunity to visit the churchyard and to see Rev Mr Zula’s grave with its fascinating Greek funerary monument. Photo: Rev Dr Thompson displaying a Bible, which was given by the Earl of Downshire to Rev Basil Patras Zula on the occasion of his ordination in 1835.